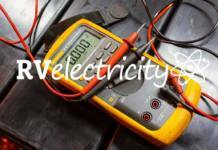 RV Electricity – Is it a leak or a noisy water heater element? My water heater started to make a noise tonight. It sounded like a leak. After fiddling around a bit, I found that if I turned the switch off inside, the noise stopped. I turned it on again, and the noise started again. Anybody ever have this happen? Any ideas? I’ve seen and heard a number of domestic electric water heaters do this, and it’s turned out to be a pinhole leak in the electric heating element. Very dangerous in an RV if you lose your shore power ground connection since it can cause a hot-skin/stray-voltage condition. There are a few simple ways to meter for this condition, which I can write about in a future RVelectricity column. Oh yes, I have an idea of what this could be, and it’s potentially dangerous if you have another failure at the same time. In this case, two small wrongs can make a very BIG wrong. Let’s explore the possibilities. Your electric water heater uses a hermetically sealed element that consists of a nichrome heating wire inside of a copper or stainless steel tube. The nichrome wire heats up a ceramic insulating structure inside of the tube, and the metal tube heats up the water. This is all hermetically sealed to keep the electricity in the nichrome heating element separate from the water, because as we all should know, electricity and water don’t mix very well. Here’s a picture of the inner workings of these hermetically sealed heating elements. Now, what happens if the electric heater element is damaged due to overheating from turning on the power to the water heater before filling it up with water, or simply from corrosion due to a worn-out sacrificial anode or hard water? In that case the hermetic seal of the metal tube can be breached, allowing the water in the tank to directly contact the nichrome heating element. So if you have a heating element with a breached hermetic seal, which likely makes noise when the power is on and the thermostat is calling for heat, then two interesting and potentially dangerous events begin to occur. First, you can begin filling up your hot water tank with hydrogen and oxygen (hydrox) gas. Now, if your house has chlorinated city water there’s apparently a secondary reaction that along with bacteria converts this hydrox gas into hydrogen sulfide gas, which smells like rotten eggs but isn’t particularly dangerous (read explosive). However, if you don’t have a chlorinated water source you are indeed filling up your hot water tank with hydrox (hydrogen/oxygen gas) in exactly the right proportions for an internal gas explosion. Now if there’s an ignition source this probably won’t make a big enough boom to rupture the tank (believe me, I’ve tried), but if you’re pulling the anode out and there’s a spark it can make a pretty scary flash/boom which you’ll really want to avoid. Take a look at this short video HERE. No, that’s not me in the video, but I may have to try this myself sometime. Yes, I’ll do it outside and not in my house. That’s called being a good husband. Second, because the nichrome heating element is exposed to the water, you now have up to several amperes of potential fault current flowing into the chassis of your RV, depending on the exact position and size of the break. I’ve actually measured this with a rusted-out electric heater element, which leads me to the next scenario. If your RV is properly grounded (via your shore power ground wire to the campground service panel’s G-N bonding point, not a ground rod on the bumper of your RV), then that ampere or two of fault current will harmlessly divert to the grounding system. 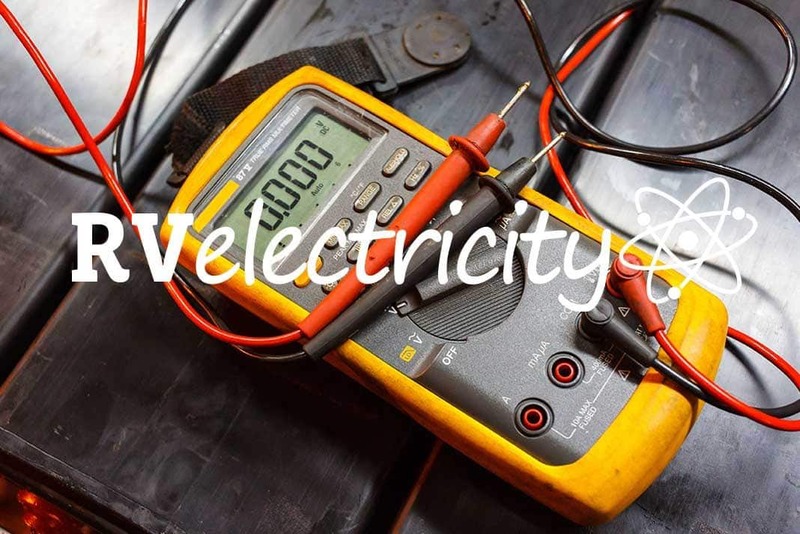 However, if you have a failed ground due to a high resistance connection in your RV’s electrical panel, the shore power cord, or between the campground pedestal and the incoming power company’s service panel, then that fault current will end up on the chassis of your RV with no place to go. And if you, a family member or a pet touches the wet ground at the same time you’re touching the RV, then you can be shocked or electrocuted. Read the article that I wrote a few weeks ago about low-, mid- and high- current hot-skin/stray-voltage HERE. Note that it only takes perhaps 30 mA (0.030 amperes) of current to put your heart into fibrillation, and a compromised water heater element can easily supply a hundred times that much fault current. Again, if your RV is properly grounded through its shore power connection (and not just a ground rod), then you should never feel a shock. That suggests if you ever feel a shock or even a tingle from your RV, then you’ve certainly lost the ground connection. If that occurs then you need to unplug from shore power immediately until its properly repaired. So if you hear a noise inside of your water heater whenever the power is on and the thermostat is turned up, then it’s time to inspect the electric heater element for damage. And if you ever feel a shock from your RV, then you’ve certainly lost the ground connection from your RV chassis back to the service panel. Right now I’m working on a simple electrical test for this scenario that any RV technician could perform in a few minutes without taking your water heater apart. Stay tuned for a future article detailing this test. As usual, this test procedure has to be invented and documented by me since I can’t find anything like it wherever I look. But it’s just one more troubleshooting tool I’m building that should help keep you all safe from shock in your RV. Next articleShould Google Fi be part of your Internet toolkit? I’ve had the same problem, but the noise (and actual dripping leak) was because the electric heating element thermostat failed and it was getting too hot. The P-T valve was just beginning to open and then you could hear the squealing start.